This fantasy story is rooted in an uncomfortably stark reality. A wistful boy, Luka lives in a post apocalyptic place where ‘people have forgotten what was important’. There are no trees, flowers or animals. 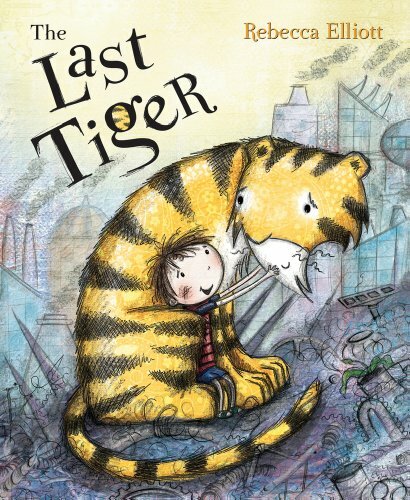 Into this drear environment comes the last tiger. Is he real or Luka’s imagination? Certainly when the tiger is freed from the menacing helicopter that whisked him away, it is magical. And the finding of the tiger’s secret garden somehow spiritual. The illustrations are original and brave managing to convey a story of darkness and light with captivating authority. A story of hope and regeneration, built on a conservation theme.